Finely chop chili and ginger and finely slice bell pepper and spring onion. Slice zucchini, carrots, and apple. Remove broccoli florets from the stem and halve cherry tomatoes. Over medium heat, toast cashew nuts in a frying pan for approx. 2 min., or until fragrant and slightly browned, then add spring onion, give it a quick toss, remove from pan, and set aside. Add oil to a second pan, then add cane sugar and caramelize over medium heat for approx. 2 min. Add chili, ginger, curry powder, paprika, and toss for approx. 1 min., then deglaze the pan with lime juice, tomato juice, and mango-passion fruit juice and add tomataoes. Stir for approx. 1 min. Season with salt. Add broccoli florets, bell pepper, zucchini, and carrots, and stir in the coconut milk and sour cream. Leave to simmer over medium heat for approx. 3 – 4 min., then add apple and sugar snap peas. 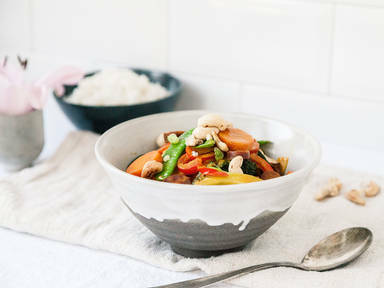 Season with salt and garnish with cashew nuts and spring onion. Enjoy!